The Weider Principles have been venerated, debated, derided, and rediscovered by countless coaches and athletes over the decades. But modern science confirms their value more than ever! 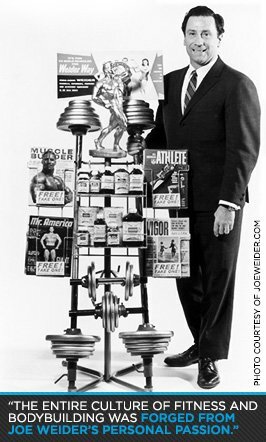 Joe Weider died on March 23, 2013. And although he lived a great life that lasted well into his 90s, many of us are left feeling that it ended too soon. I wasn't ready to see him go. Joe was a childhood hero of mine. He influenced me to pursue weightlifting and bodybuilding at a young age, and later, to study the science behind it all. Being hired by Joe to be the science editor of Muscle & Fitness, M&F Hers and FLEX was a dream come true, and it is a responsibility that I take seriously today. Joe left us so much. One could argue that the entire culture of fitness and bodybuilding was forged from his personal passion for, and promotion of, the sport and pursuit of fitness. 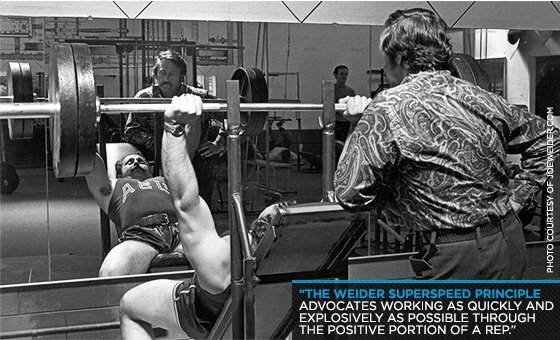 One of his most perfect legacies, and one that I'm particularly grateful for, are the Weider Principles. 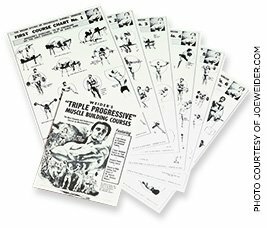 This is a straightforward list of approximately 24 training principles—the number has grown over the years—that provide a guide to some of the most useful techniques to apply in the gym. Some have tried to downplay the principles as nothing more than old-school bro science. I can assure you that Joe was a visionary when it came to the science behind strength training. 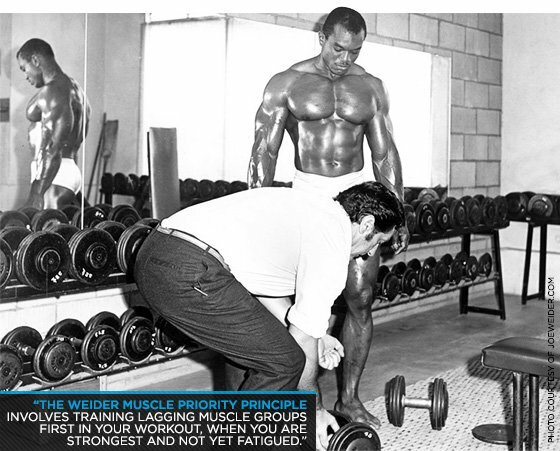 Here I will reintroduce you to eight of my favorite Weider Principles and dive into recent science that confirms Joe had it right long before anyone else. What it is: The Weider Principle of forced reps involves reaching failure on a set and then having a spotter help you get a few extra reps. This is a way of pushing your muscles beyond momentary failure in order to force them to grow. The research says: A study from Finland suggests that forced reps can be effective for instigating muscle growth. The researchers had 16 weight-trained men perform a leg workout that consisted of four sets of leg presses, two sets of squats, and two sets of leg extensions. In one trial they performed the workout using their 12-rep max on each exercise and performed each set until reaching muscle failure. In another trial they used a weight slightly heavier than their 12-rep max so that they would reach failure before the 12th rep, at which point a spotter helped them do forced reps until they finished 12 reps. The authors reported in the International Journal of Sports Medicine that when the subjects used forced reps, their growth hormone (GH) levels rose about three times higher than when they trained to just failure. GH levels are critical for instigating muscle growth, as well as encouraging fat burning. Researchers from Ashton University backed this up in a study where trained football players using forced reps in their training for 10 weeks lost significantly more body fat than those not using forced reps.
How to use it: To use forced reps, simply take a set to muscle failure, and then have a spotter help you perform 2-3 more reps. The assistance should just be enough to allow you to do the majority of the work. Use this on the last set of each exercise in your workout. When training alone, you can use this technique on isolation exercises by using the non-working limb to assist the working side. What it is: The Weider Pre-Exhaustion Training Principle advocates training single-joint or isolation exercises first in your workout, followed by multi-joint exercises. The point of pre-exhaustion is to fatigue a target muscle group so that when you perform the following multi-joint exercise, the target muscle is already fatigued and receives ample overload without the set ending due to fatigue of other muscle groups. But does this method lead to greater muscle growth? Yes, according to a 1996 study showing that subjects using the pre-exhaustion system gained significantly more muscle mass than people using the standard training protocol of doing multi-joint exercises first and isolation exercises last. How to use it: To use this method for chest, you could start your workout by doing three sets of a chest isolation exercise such as the dumbbell flye, and then three sets of another chest isolation exercise such as the cable crossover. Then follow with multi-joint exercises such as the bench press and incline dumbbell presses, each for three sets. 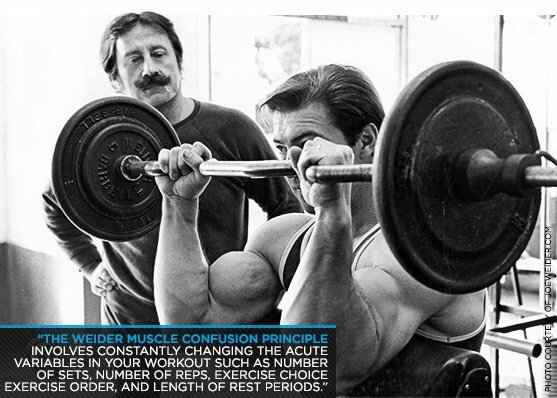 What it is: The Weider Muscle Confusion Principle involves constantly changing the acute variables in your workout such as number of sets, number of reps, exercise choice, exercise order, and the length of rest periods. This alternation is designed to prevent you from getting in a rut and slowing or stalling your progress. The research says: A study conducted by researchers at the Tempe campus of Arizona State University compared two groups of trained subjects, one using an undulating periodization program—a fancy term for muscle confusion—and the other with a linear periodization program. In the undulating program, the acute variables were changed with every workout, whereas in the linear program, they were changed every few weeks. After 12 weeks, people following the undulating periodization program increased their bench press and leg press strength by 100 percent more than those following the linear program. Researchers from Brazil saw even more drastic differences when they had trained subjects follow one of three programs: an undulating periodization program, a linear periodization program, or a consistent non-periodized program of 8-10 reps per set. The training program consisted of a two-day split with 3-4 total training days per week. After 12 weeks, the group following the muscle confusion program increased its bench press by about 60 pounds, almost 200 percent more than both the linear periodization program and the non-periodized program. The undulating program also increased the subjects' strength on the leg press by a staggering 275 pounds, 400 percent more than the non-periodized program and more than 300 percent more than the linear program. This principle can apply to muscle growth as well as strength. Researchers from the Federal University of Rio De Janeiro had a group of untrained men follow a linear periodization program of two sets of 12-15 reps per exercise for four weeks, then three sets of 8-10 reps per exercises for four weeks, and finally four sets of 3-5 reps per exercise for the final four weeks. Meanwhile, a group used those same set and rep ranges but cycled them each time they trained. The results: The group following the undulating plan increased its triceps size by about five percent, while the linear group saw no such increase. The undulating group also increased its biceps size by 10 percent—twice that of the linear group. How to use it: Simply change acute training variables every workout. One of the easiest ways to do this is to change the weight and the rep ranges you use. You could use heavy weight and low reps (5-7) in one chest workout, light weight and high reps (20-30) in the next, then moderate weight and moderate reps (8-10), and finally light weight and high reps (12-15). What it is: This principle involves training lagging muscle groups first in your workout, when you are strongest and not yet fatigued. This allows you to train that muscle group with heavier weight and higher intensity, which is critical for instigating muscle growth and strength increases. The research says: Brazilian researchers had men train their upper body for eight weeks doing either large muscle groups like the chest, back, and shoulders first, or with arms first. The former workout's exercise order was bench press, lat pull-down, shoulder press, barbell curl, and triceps extension, while the other workout was in the inverse order. The authors reported that the subjects' strength on the exercises performed at the start of the workout increased more than for the exercises performed at the end. The difference was most significant when it came to lifting arms first. How to use it: I'm not necessarily suggesting that you train your biceps and triceps before your chest, back, or shoulders. But to prioritize your arms, consider training them either alone, or before you train an unrelated muscle group, like legs. 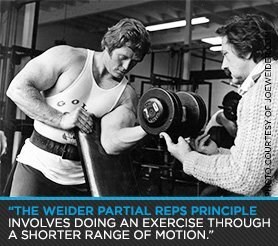 What it is: The Weider Principle of Partial Reps involves doing an exercise through a shorter range of motion (ROM) than normal. For example, you could perform half squats in addition to, or instead of, full-ROM squats. The research says: University of Southern Mississippi at Hattiesburg scientists had 56 men follow a 10-week strength training program that included three sets of the bench press done twice per week. One group trained with a full ROM using about 65 percent of their one-rep max. The other group trained with a partial ROM, about 2-5 inches from full elbow lockout, using about 100 percent of their one-rep max. At the end of the 10 weeks, both groups increased their full-ROM bench press by about 25 pounds. The fact that using partial reps still increased the subjects' full ROM bench press has numerous implications. For one, it suggests that if you have an injury that prevents you from doing an exercise through the full ROM, you can still achieve full benefits by going through a comparatively small ROM. In addition, it suggests that if you combine partial rep training with full-ROM training, the gains in strength may be even greater than either training method alone. How to use it: Perform 2-3 sets of an exercise through the last 2-5 inches of the ROM, using 100 percent of your one rep max on that exercise. Do as many reps as you can in each set. Then follow with 2-3 sets of full ROM sets of that exercise. Alternately, if you have an injury and can't tolerate the full ROM of the exercise, just work through the ROM that you can tolerate. What it is: The Weider Superspeed Principle advocates working as quickly and explosively as possible through the positive portion of a rep. This helps build explosive power, speed, strength, and muscle size. What's funny about this principle is that strength scientists have only been studying speed-rep training intently for less than 10 years now, yet Joe Weider promoted this type of training for decades. The research says: Australian scientists reported in a 2005 study that subjects doing biceps curls with fast reps for six weeks significantly increased their biceps curl strength over subjects doing biceps curls with slow and controlled reps. Similar results have been found in other studies using the bench press and squat. How to use it: Start each exercise with 1-2 sets using about 50 percent of your one-rep max, or a weight you can normally lift for at least 25 reps. Perform 3-8 reps as fast and explosively as possible during the positive part of the rep, but go slow and controlled on the negative part of the rep. Follow these sets with 2-3 sets of normal speed. What it is: Descending sets, or dropsets, involve working to muscle failure on a set and then immediately reducing the weight and continuing to do more reps. The standard method to do this is to reduce the weight by enough that you can complete a similar number of reps to the original set. This extends one working set into two brutal sets, boosting growth hormone and encouraging muscle growth. The research says: The challenge with dropsets is finding the ideal amount of weight to reduce for the dropset. Research performed by the Weider Research Group looked into this question. We had 10 trained bodybuilders perform dropsets by dropping 10, 20, 30, or 40 percent of their 10 rep max weight after reaching failure on one set of incline dumbbell flyes, dumbbell lateral raises, lat pull-downs, dumbbell biceps curls, triceps press-downs, leg extensions, and leg curls. For most of the exercises tested, a drop of 20-30 percent resulted in the subjects being able to complete about 10 reps.
How to use it: Take the last set of each exercise to muscle failure. Then immediately reduce the weight by 20-30 percent and continue performing reps until you reach muscle failure again. What it is: The Weider Principle of staggered sets involves training several muscle groups together, alternating the muscle groups you train with each successive set. This is typically done with 2-3 muscle groups, usually with 1-2 larger muscle groups and 1-2 smaller muscle groups. For example, you could do one set of chest, then move on to one set of quads, and then one set of calves. Then you would rest and repeat the exercises in the same order for the number of sets you desire. The principle holds that the larger muscle groups recover while you train the smaller muscle groups. The research says: A recent study from Spain supports the effectiveness of this principle. The scientists had strength-trained subjects perform two different workouts. One was a standard five-set bench press workout using their six-rep max, resting three minutes between sets. The other workout consisted of staggered sets alternating the bench press, leg extension, and calf raise, doing five sets of each with their six-rep max and resting just 35 seconds between exercises. Although the researchers referred to this as "circuit training," it more closely resembles staggered set training, because circuit training typically involves the majority of the body's major muscle groups. They reported in a 2008 issue of the Journal of Strength and Conditioning Research that the subjects were able to complete the same number of reps on the bench press during the staggered set workout as they did in the normal bench press training workout. The only difference was that the staggered set training boosted their heart rate significantly more than the normal set training. How to use it: If you want to save time without compromising strength, all while getting a cardio workout and burning more body fat, give staggered set training a try. Pick three non-competing exercises that include both large muscles such as the chest, legs, back, and small muscles like the calves, arms, and abs. J Simão, R., et al. Comparison between nonlinear and linear periodized resistance training: hypertrophic and strength effects. J Strength Cond Res. 2012 May;26(5):1389-95.